Ernest F. John class of 1942, of Castle Hills, Texas died on August 3, 2001. He retired from the U.S. Air Force as a Brigadier General in 1973 after serving as Deputy Chief of Staff for Intelligence at the Pacific Air Forces headquarters at Hickam Air Force Base in Hawaii. He held many other positions in the air force in the United States, Germany, France, and Vietnam. He flew B-24 bombers in Italy as a pilot and flight commander during World War II until his plane was shot down in April 1944; he was interned in several POW camps in Germany. His decorations include the Distinguished Service Medal, the Legion of Merit with two oak leaf clusters, the Distinguished Flying Cross, the Air Medal with four oak leaf clusters, and the VNAF Distinguished Service Cross. Brigadier General Ernest F. John was deputy chief of staff, intelligence, Headquarters Pacific Air Forces Hickam Air Force Base, Hawaii. He was responsible for managing the air intelligence collection and application throughout the Pacific theater and advising the commander in chief, PACAF, on all matters pertaining to intelligence. General John was born in Douglas, Arizona, in 1921. He attended Valley Forge Military Academy, Wayne, Pennsylvania, and graduated from Brown University, Providence, Rhode Island, in May 1942, with a bachelor of arts degree in political science. He entered the U.S. Army Air Corps aviation cadet program and, after attending flying schools in Ballinger, San Angelo and Lubbock, Texas, received his commission and pilot wings in May 1943. After attending B-24 aircraft replacement training, he was assigned to the newly organized 450th Bombardment Group at Alamagordo, New Mexico, where he was qualified as a B-24 aircraft pilot and flight commander. In December 1943, he accompanied the 450th Bombardment Group to Italy where he flew combat missions until shot down over northern Italy in April 1944. He was interned as a prisoner of war in camps in the vicinity of Sagan, Nurnberg, and Noosberg, Germany, until April 1945 when the camp at Moosberg was liberated by the U.S. Seventh Army. instructor at Orlando and later at Craig Field, Alabama. In June 1947, he entered Georgetown University graduate school, and graduated in February 1949 with a master's degree in international relations. transferred to Headquarters U.S. Air Forces in Europe, Wiesbaden, Germany. During the period 1956-1958 General John commanded the 3302d Pilot Training Group, Spence Air Base, Georgia, after which he attended the Air War College, Maxwell Air Force Base, Alabama, graduating in June 1959. He returned to Washington where he served sequentially in the Office of the Assistant Secretary of Defense (International Security Affairs) as deputy director, Office of Operations Coordinating Board Affairs; deputy director, Coordinating Staff (National Security Council and Collateral Activities); and then chief and project director, Coordination Division, Policy Planning Staff. General John was assigned to Headquarters Pacific Air Forces, Hickam Air Force Base, Hawaii, in August 1963 as director, Warning and Threat Assessment; deputy director of intelligence; and director of intelligence. In August 1966 he returned to Headquarters U.S. Air Force as director of collection, Assistant Chief of Staff, Intelligence. He next was assigned as vice commander, U.S. Air Force Security Service, Kelly Air Force Base, Texas, in November 1969.
in chief, Pacific Air Forces, in February 1972 and assumed his current duties in March 1972. His military decorations and awards include the Distinguished Service Medal, Legion of Merit with oak leaf cluster, Distinguished Flying Cross, Air Medal with four oak leaf clusters, Joint Service Commendation Medal, Air Force Commendation Medal, Army Commendation Medal, Republic of Vietnam Air Force Distinguished Service Order, 1st Class, Vietnam Service Medal with oak leaf cluster, and Republic of Vietnam Campaign Medal. He was promoted to the grade of brigadier general effective March 1, 1969, with date of rank Feb. 22, 1969. On Friday, August 3, 2001 in San Antonio, TX. He was born in 1921 in Arizona, the son of an army officer, and graduated from the Valley Forge Military Academy in 1938 and from Brown University in 1942. He was commissioned through the Army Aviation Cadet Program in May 1943, flew B-24 bombers in Italy as a pilot and flight commander until he was shot down in April 1944, and was interned in several POW camps in Germany until April 1945. He subsequently served in a variety of assignments in the U.S., Germany, France, and Vietnam. A command pilot, his decorations include the Distinguished Service Medal, the Legion of Merit with two oak leaf clusters, the Distinguished Flying Cross, the Air Medal with four oak leaf clusters, and the VNAF Distinguished Service Cross. 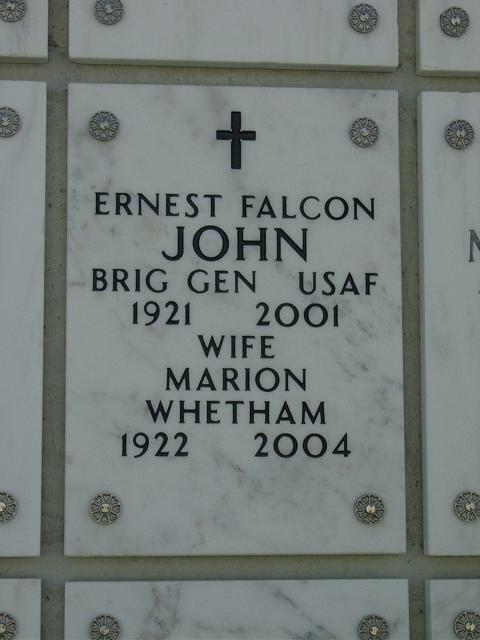 He retired from the US Air Force on January 31, 1973, and has since resided in the city of Castle Hills with his wife of 56 years, the former Marion Whetham of Brooklyn, New York. He received an MA degree from Georgetown University in January 1949, and a JD degree from San Antonio's St. Mary's University School of Law in May 1975. He was a member of the San Antonio and Texas Bar Associations and a life member of the Order of Daedalians. In addition to his wife, he is survived by his sons, Douglas F. and William T. John and three grandsons, David, Steven and Matthew, all of northern Virginia. An inurnment service with Full Military Honors will take place in Arlington National Cemetery on Friday, September 7, 2001 at 9:00 a.m. Anyone wishing to attend should arrive at the administration building by 8:30 a.m. Arrangements with Porter Loring, 1101 McCullough, San Antonio, Texas 78212. 1-800-460-2704.